We have embarked upon an international collaboration to realize the promise of nanosystems tools with the complexity and mass-production-scale of VLSI systems. Figure 1. Realization of a 200mm SOI wafer containing more than 3 million NEMS devices. 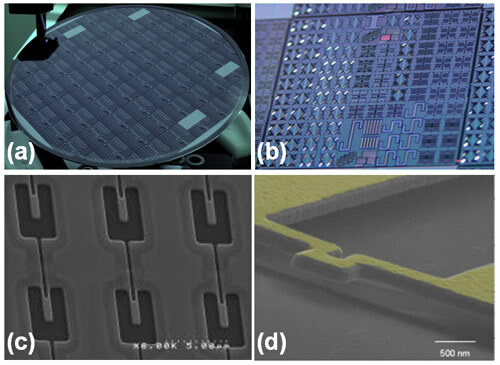 (a) Photograph of the full wafer (b) Zoomed-in photograph of one 20-mm wafer die containing a variety of nanofabricated resonator structures (c) Scanning electron micrograph of a section of a cantilever array. (d) Scanning electron micrograph (oblique view) of an individual array component. The metal layer is colored for clarity. Nanoscience offers immense potential to enable unprecedented tools for scientific research and to establish new commercializable technologies. For example, individual nanosensors provide both unprecedented sensitivity (at the thermodynamic or quantum limit of detection) and extreme locality of response (at the molecular scale). But this potential can be harnessed, practically, only through the fusion of three ingredients—arrays of such nanodevices, their robust production en masse, and largescale-integration of these into coherently engineered systems. With systems-level approaches the full promise of nanoscale tools, and of active (powered) device nanotechnology, will emerge. The fulfillment of this potential is inevitable; the question now is how best to accelerate the process. To date progress has been much slower than originally envisaged. It would not be unfair to say that only incremental, or perhaps, partial advances (at best) have been made, worldwide, towards this compelling nanotech vision. On the bright side, though, the cause of this impasse is clear. Almost all pioneering investigations in nanoscience have, so far, focused upon individual devices or physical effects. Such "unit" advances hold great promise as fundamental building blocks for future complex nanosystems. This promise is often been invoked to justify continuation of the field's scientific exploits. But little work has been carried out to assemble individual elements into the complex architectures that can enable, for example, the next generation of biological tools, or highly-integrated nano-photonic or -plasmonic technologies. This impasse exists, in large part, because scale-up to the next level of complexity requires $B- foundry-class tools. These are generally inaccessible to the academic community for scientific research and technology prototyping. And, at the university scale, it is essentially impossible to scale up to complex nanosystems. The Alliance for Nanosystems VLSI (Very-Large-Scale Integration) is an unprecedented partnership we have founded to break this impasse. It started in 2007 as an international collaboration between researchers in our group and at Caltech’s Kavli Nanoscience Institute, and those in microsystems science & engineering at one of the world's premier, state-of-the-art microelectronics research foundries: CEA/LETI-Minatec in Grenoble, France. This partnership is now expanding into a highly integrated network of researchers from an international cohort of top-tier universities and government research laboratories. The focus of the Alliance is both singular and clear—namely, to transition advances in unit "academic" nanoscience into the realization of complex nanotechnological systems. Our hypothesis is that the "unit" advances from nanoscience with know-how and technology from state-of-the-art microelectronics VLSI can together advance the next era of active-device nanotechnology. A significant milestone in this collaboration has been the realization, in 2007, of a foundry run of 200mm wafers of NEMS devices (Figure 1). Each wafer contains more than 3 million active nanodevices, a number exceeding the sum total of devices made in the previous 16+ years of the field. Such an achievement is a small step towards engineering complex nanosystems that will positively impact a broad range of research goals in our group, from highly-multiplexed and CMOS-powered NEMS sensor arrays for mass spectrometry, to high-throughput biosensing assays with integrated microfluidics. For more information, please see the Alliance website at http://www.nanovlsi.com.